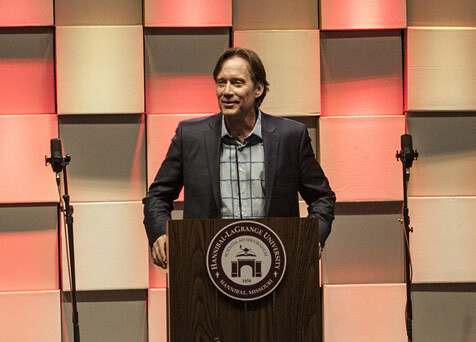 Early evening, drizzly conditions did not stop the more than five hundred guests from attending Hannibal-LaGrange University’s 74th Annual Booster Banquet featuring guest speaker, actor, director, and author, Kevin Sorbo. Sorbo’s personal testimony included the story of his battle back from three strokes in 1997 and the background for his book “True Strength.” He shared his journey from playing Hercules, the strongest man in the world, to his realization that he was just a mere mortal and how nearly dying saved his life. “When those strokes hit me, I went from what I thought was a physical specimen to a guy who couldn’t even stand up without falling down. My life changed forever in the snap of a finger, or the crack of a neck, in my case. This is where faith and hope come in.” Sorbo went on to tell about how he spent the next several months learning how to balance and walk again. “Talk about being tough on the ego,” he stated with honesty in his voice. He told about how going to physical therapy wiped him out and how for the first time in five years he started watching TV again. He wanted to escape the thoughts of his uselessness and hopelessness that was running through his mind. He discovered sitcoms like “Friends” and “Mad About You” and they made him laugh. “Laughter truly is the best medicine,” he stated. The medical community didn’t offer him any hope. They couldn’t definitely say the cracking of the neck caused the strokes. Which left Sorbo feeling like a walking time bomb. “That’s when the panic and anxiety attacks hit me,” he said. “And let me tell you, they’re not fun.” The doctors said the best he could hope for is however he was feeling and doing in 3-8 months was the best he could hope for. In addition, those in attendance at the banquet also had the opportunity to hear a testimony from HLGU student, Ashley Neeley. Following Ashley’s testimony, Chamber Choir, one of HLGU’s traveling ministry teams, performed three songs. All in all, an enjoyable evening was had by all in attendance. For more information about HLGU’s annual Booster Banquet please contact Director of Alumni Services and Institutional Advancement, Lauren Youse at 573.629.3126 or via email at lauren.youse@hlg.edu.